Learn what the average tuition charge is for U.S. colleges, and how Bethel University Minnesota stacks up. Plan money wise for your college degree. Compare Bethel University Minnesota's tuition charges to typical colleges. Check for price tendencies and potential increases to find out whether you have to allocate more resources for the next four years of tuition. For nationwide, regional and statewide comparisons, look at the table below to see how Bethel University Minnesota measures up to other schools. How Much Will Tuition & Fees Be for Bethel University Minnesota? In the 2017 - 2018 academic year, regular students at Bethel University Minnesota were charged $36,210, before adjustments for financial need. Of this amount, the expense of tuition totaled $36,060. $150 was fees. As opposed to public colleges, Bethel University Minnesota does not provide a tuition discount to students who live in state. Bethel University Minnesota fees and tuition is the sum billed to students for one academic year, and does not include room and board. Having said that, a lot of students end up having to pay below full tuition after receiving financial aid and other discounts. Look at the table below to see 2017 - 2018 school year costs. For more info, click Bethel University Minnesota Part Time Tuition & Fees. There has been a rise of 3.0% in Bethel University Minnesota fees and tuition for out-of-state students in the past 5 years. Tuition grew by 3.0% and fees grew by 0.0%. This year, students should anticipate paying $37,293 if the growth keeps up. Due to price increases, the full cost of a four-year Bethel University Minnesota degree will be $155,995, and the full expense of a two-year degree would be $75,700, which doesn't include additional costs such as books, transportation, and room and board. 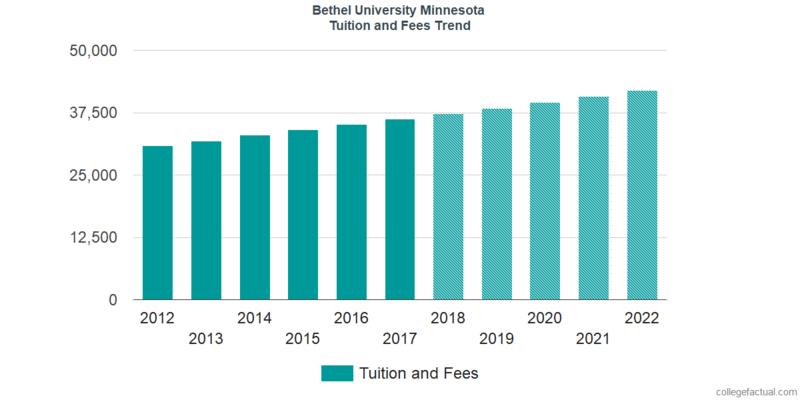 The following chart shows predicted upcoming fees and tuition for undergraduates at Bethel University Minnesota. Pay attention to how much college fees and tuition is increasing every year. At a lot of schools students will end up spending more on their final year of college than they did for their first.